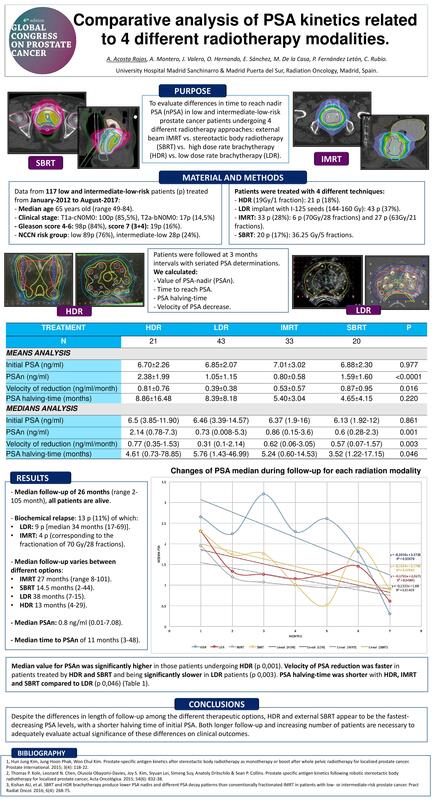 To evaluate differences in time to reach nadir PSA (nPSA) in low and intermediate-low-risk prostate cancer patients undergoing 4 different radiotherapy approaches: external beam IMRT vs. stereotactic body radiotherapy (SBRT) vs. high dose rate brachytherapy (HDR) vs low dose rate brachytherapy (LDR). From January-2012 to August-2017, 117 patients with a median age of 65 y/o (range 49-84 y/o) and with low (89p, 76%) or intermediate-low (28p, 24%) risk prostate cancer patients according to NCCN criteria were admitted at our institution. Clinical stage was T1a-cN0M0 in 100 patients (85.5%) and T2a-bN0M0 in 17 patients (14.5%). Gleason 4-6 in 98 p (84%); Gleason score 7 (3+4) in 19 p (16%). - 21 p (18%) underwent HDR (19 Gy/in 1 fraction). - 43 p (37%) underwent permanent LDR implant with I-125 seeds (144-160 Gy). - 33 p (28%) were treated by external-beam IMRT: 6 p received a total dose of 70 Gy in 28 fractions whereas remaining 27 p were treated up to a total dose of 63 Gy in 21 fractions. - 20 patients (17%) were underwent SBRT up to a total dose of 36.25 Gy in 5 fractions. Patients were followed at 3-months intervals with seriated PSA determinations. We calculated value of PSA-nadir (PSAn) and time to reach PSA. 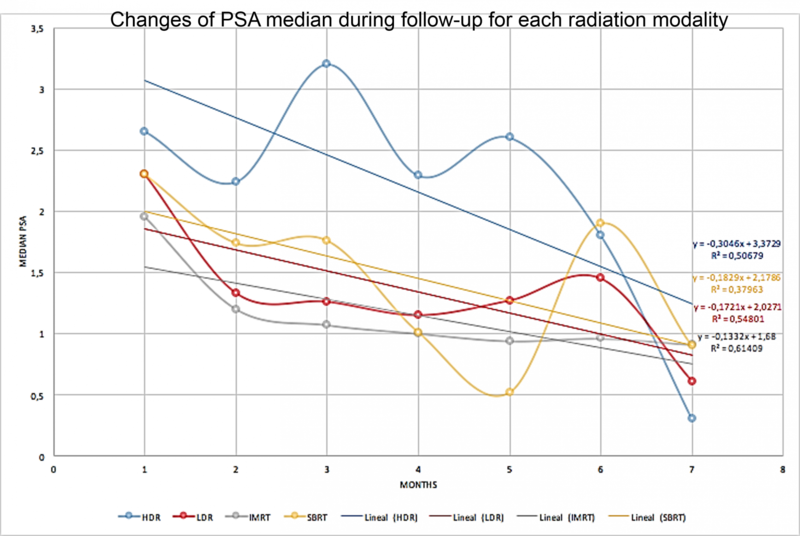 Additional calculations regarding different radiation alternatives included PSA halving-time and velocity of PSA decrease. With a median follow-up for the entire cohort of 26 months (range 2-105 months) all patients are alive; biochemical relapse was observed in 13 patients (11%), of which 9 had been treated with LDR (median 34 months (17-69)) and 4 patients with IMRT. All relapses after IMRT corresponded to patients treated up to 70 Gy in 28 fractions. Median follow-up varies between different options: IMRT 27 months (range 8-101); SBRT 14.5 months (2-44); LDR 38 months (7-15); HDR 13 months (4-29). Median PSAn for the entire cohort was 0.8 ng/ml (0.01-7.08) with median time to PSAn of 14 months (1-99). Median value for PSAn was significantly higher in those patients undergoing HDR (p 0,001). Velocity of PSA reduction was faster in patients treated by HDR and SBRT and being significantly slower in LDR patients (p 0,003). PSA halving-time was shorter with HDR, IMRT and SBRT compared to LDR (p 0,046) (Table 1). Despite the differences in length of follow-up among the different therapeutic options, HDR and external SBRT appear to be the fastest-decreasing PSA levels, with a shorter halving time of initial PSA. Both longer follow-up and increasing number of patients are necessary to adequately evaluate actual significance of these differences on clinical outcomes. PSA Kinetics, SBRT, IMRT, HDR brachytherapy, LDR brachytherapy.